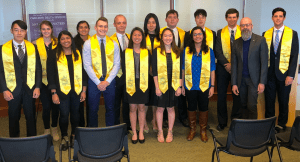 Yesterday, 22 new students were inducted into the Omicron Delta Epsilon (Economics) Honors Society. 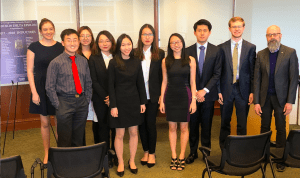 The new inductees joined the current 18 student members who were inducted last year as juniors in a formal ceremony held in the Tepper Grand Room. Led by the head of the Economics department Professor Chris Sleet, the new inductees received certificates as well as membership cards. Founded in 1963, Omicron Delta Epsilon (ODE) is dedicated to recognizing scholastic attainment and outstanding achievement in the field of economics with its own publication journal The American Economist. It is also one of the world’s largest academic honor societies. 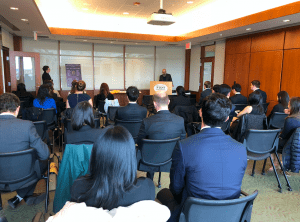 On behalf of Executive Director of the undergraduate Economics program Dr. Carol Goldburg and Assistant Director (as well as former ODE member) Ms. Kathleen Conway, they are excited and honored to welcome the 22 new members into the honor society. Additionally, thanks to Dr. Goldburg, Kathleen, and Prof. Sleet for all they do for the Economics program at CMU. As an economics student, I really appreciate the work that they do to ensure we as students have the necessary resources to have as smooth and successful academic experience. Go Econ!